Stuart died On 17 December, after a long and very bravely fought fight against bowel cancer, at his home in Newport. Stuart was aged 66 when he died. He leaves his wife and partner through his illness Trish and was dearly loved by Suzanne and Tom. 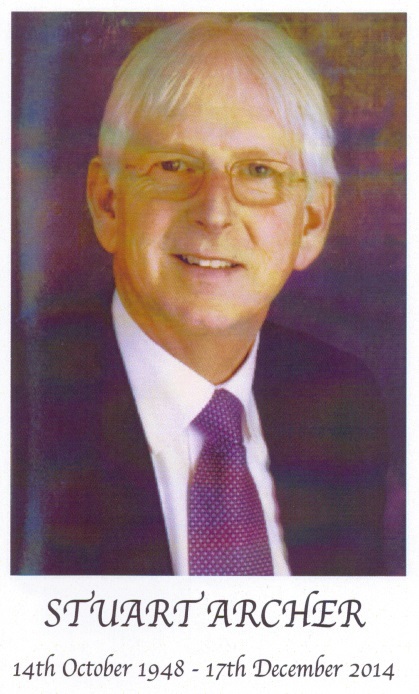 He will be missed not only by his family but by many friends and the town of Chepstow, where he had worked with Sandra and the staff at Archer & Co. and had gained the respect of many for his courteous behaviour and dedicated service to his clients. He will also be missed and remembered by those who knew of his illness and his resolute determination to survive with humour as long as possible, making the most of every moment he could. I was privileged to have had several very private conversations with Stuart during his illness & treatment where, even when he knew the outcome was inevitable, he courageously sought out opportunities to be used in new trials that would not just prolong his own life but would provide information to help others following down the path! My thoughts are with his family and those whom he had worked with for so many years, who miss him greatly, at this challenging time, when we remember his life on the anniversary of his death. A Celebration for the life of Stuart Malcolm Archer, in accord with his wishes, was held at St. Pierre Golf and Country Club on Thursday 8th January 2015 at 13:00hrs. The service of commemoration at St. Pierre was held after a private family ceremony at the Crematorium and was conducted by a Civil Celebrant Gill Fortescue with an extensive, and very appropriate eulogy. The Eulogy was delivered by Stuart’s long term friend David Evans. This entry was posted in Cancer, Cryoablation, Kidney Cancer, Magnetic resonance imaging, Surgery, Tumour and tagged Archer and Co, ARCHER Stuart, Chepstow, GL-W, Greg Lance-Watkins, Greg_L-W, IN MEMORIAM, Sandra Archer, Stuart Archer, Trish Archer. Bookmark the permalink. ← Alzheimer’s DISEASE Destroys YOU & YOURS Cancer & Heart Attacks Are Different!